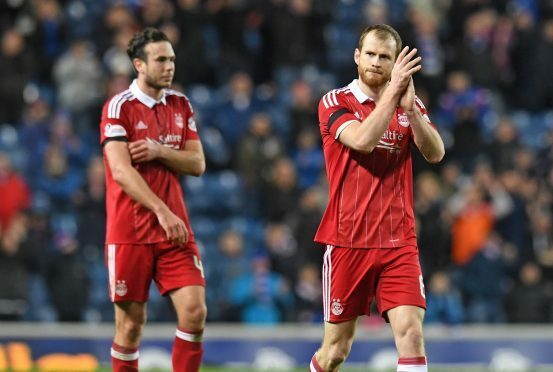 Aberdeen defender Mark Reynolds insists his side has the resolve and the qualities to hold off the challenge of Rangers and Hearts for second place in the Premiership. The Dons lost 2-1 to the Light Blues at Ibrox on Saturday in a frantic game where both teams ended the match with 10 men. The loss means Aberdeen remain in fourth place, five points behind Mark Warburton’s side. The Dons have two games in hand on their rivals, the first of which is at Pittodrie tomorrow against Kilmarnock tomorrow. Reynolds said: “It is going to be tough, but we have the experience of being up there for a few seasons now and I’m confident as we have players who will ensure we push on. “Last season all the talk was Aberdeen couldn’t beat Celtic but we beat them twice. We have answered questions about our character plenty of times. “We’ve got quality right through the squad and it will show this month where we have to play eight games. Aberdeen’s performance at Ibrox was a huge improvement on their poor display against Celtic in the Betfred Cup final at Hampden last Sunday, but Reynolds was frustrated to come away from Glasgow with nothing to show. He said: “Saturday was a sore one to take, but we put a lot more into it and gave a good account of ourselves. “It was more like us and there are positives we can take from it, but also things we can work on before Tuesday. “It was a game of fine margins. A ball into the box took a deflection and fell for Kenny Miller who put the ball in the back of the net. The outcome could have been different had Jayden Stockley converted his chance when the game was goalless. Reynolds said: “Jayden knows in games like that his header had to go in and if it had it would have changed the game. We’re disappointed but we can’t go over every incident and debate what else could have happened. “He knows it was a great chance and he held his hands up, but mistakes are made.